Christmas is probably the time of year when, certainly in the West, there is an overwhelming plethora of traditions and practices that each culture likes to embrace. Many are similar but there is also a huge range of completely different ones. In this article we look at a few of the more extraordinary, well extraordinary to us British at least ! Ethiopia (and especially the Ethiopian Orthodox Church) still use the old Julian calendar, so the celebrate Christmas on January 7th, not December 25th. Christmas Eve, therefore, falls on January 6. On that night, priests lead processions throughout cities and villages in which they carry elaborately decorated umbrellas and wear their best traditional clothing. The processions end at churches for Mass. On the morning of Christmas, which is called Ganna, presents are exchanged, people feast and some also take part in sports. 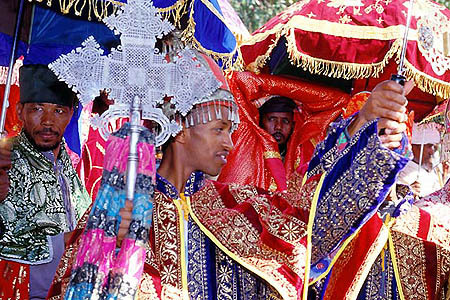 In addition to this one of the most popular holiday celebrations in Ethipia is Timket, which falls on January 19 and observes Jesus’ baptism in the Jordan River. The video below shows a Timket celebration from 2003 in Addis Ababa, Ethiopia. 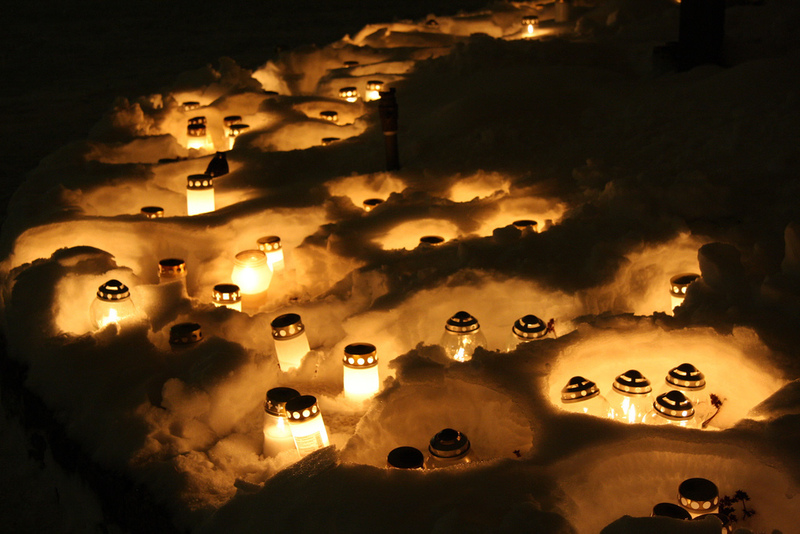 On Christmas Eve, Finns traditionally place candles on the graves of relatives. The tradition has its roots in pre-Christian times, when ancient Finns believed that the Winter Solstice — which is around the same time as Christmas — brought out the spirits of the dead. Food would be left out on tables and families would sleep on the floor in order to let the dead have a good meal and a place to rest when they visited. The candle tradition remains, and it became especially popular after the 1920s as Finns began to put candles on the graves of dead soldiers. Today, Christmas Eve is still a significant night for honouring those who have died in war. The practice of putting candles by graves around Christmas is also common in Estonia. Christmas Eve starts with fasting and ends with feasting in largely Roman Catholic Poland. 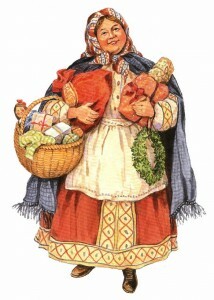 The Christmas meal, wigilia, is one of the most important meals of the year. A significant part of it happens when families and close friends share in eating a piece of Christmas wafer, which is typically stamped with a nativity scene or another Christmas symbol and has been blessed by the local bishop. Families exchange gifts on Christmas Eve and traditionally end the night by attending Midnight Mass. Babushka is a traditional Christmas figure who distributes presents to children. Her name means grandmother and the legend is told that she declined to go with the wise men to see Jesus because of the cold weather. However, she regretted not going and set off to try and catch up, filling her basket with presents. She never found Jesus, and that is why she visits each house, leaving toys for good children. The role of Father Christmas is played by Dedushka Moroz or Grandfather Christmas. In the traditional Russian Christmas, special prayers are said and people fast, sometimes for 39 days, until January 6th Christmas Eve, when the first evening star in appears in the sky. Then begins a twelve course supper in honour of each of the twelve apostles – fish, beet soup or Borsch, cabbage stuffed with millet, cooked dried fruit and much more. 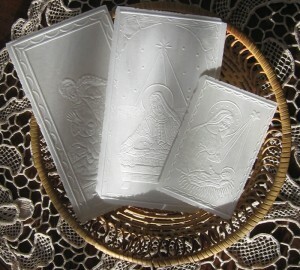 On Christmas Day, hymns and carols are sung. People gather in churches which have been decorated with the usual Christmas trees or Yelka, flowers and coloured lights. Christmas dinner includes a variety of different meats – goose and suckling pig are favourites. Mexico calls Christmas Navidad. They celebrate Christmas for nine days with Las Pasdas. It is a time where people dress as Mary and Joseph, travelling from house to house asking if Mary may stay the night. They are told the Inn is full. 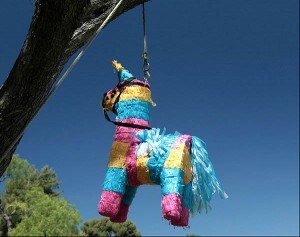 After which the door opens back up and all are invited in for a party with food, songs, and for the children a Pinata. The Pinata is made of paper mache and filled with all kinds of goodies. The object is to break it open with your eyes blindfolded. After which the children all dive for all the goodies they can pick up. On the ninth night they are told yes there is room for Mary in the stable and all come in for food and after all go to Church to celebrate the birth of the Christ Child.